Spring is finally here, but lower than average temperatures and squalid, half-melted snowbanks remain, reminders of the harsh winter that wreaked havoc on local infrastructure and tested New Englanders’ spirits. That clumsy, drawn-out transition between seasons, where early bulbs pop up on lawns still half-blanketed in snow, was on artist Jenine Shereos’s mind when she created her latest work, a temporary outdoor installation titled “Thaw.” Displayed on Jamaica Pond’s frosty shores early last month, the piece — five bottle-shaped ice sculptures encasing various flower and plant specimens — was both a visual dichotomy and a medium for winter and spring to coalesce. 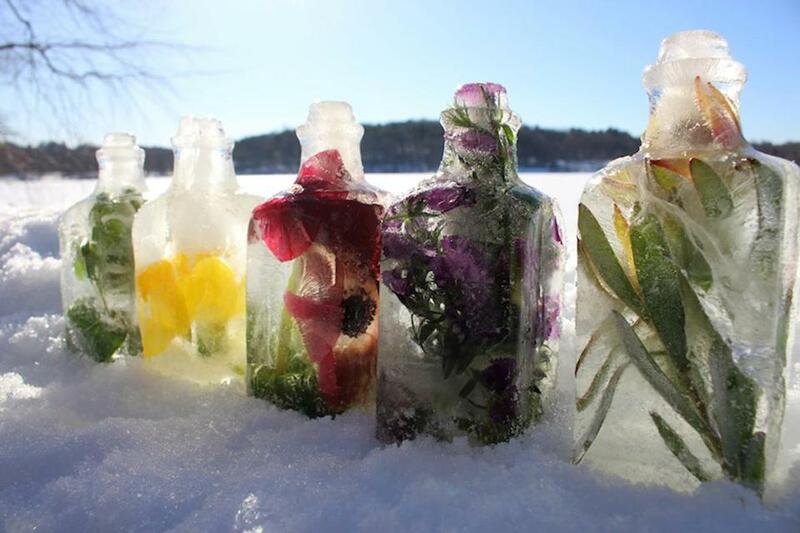 Shereos, 36, used a resin mold to create the 7-inch-tall ice bottles, which — each encapsulating a different plant — featured colorful specimens of St. John’s wort, daffodil, anemone, Blue Paradise, and leucadendron. Striking against a monochromatic landscape, the bottles were lined up in the snow along a walking path, with the frozen pond serving as a backdrop. Camera in hand, the artist returned to the site several times in the days after setting up the installation, documenting the melting process and the resulting transformations in shape and color. Having explored natural processes in much of her artwork, Shereos wanted to do the same with “Thaw,” introducing an uncontrollable element to the process. She was curious not only to see how the installation changed as it melted, but also whether people would move or even take the bottles. Surprisingly, no one disturbed the bottles, and Shereos hopes that the installation evoked certain individual connotations — even if fleeting — for viewers walking by. Exhibiting “Thaw” at Jamaica Pond wasn’t a random choice. Besides knowing it was a good spot for exposure, Shereos — who moved to Boston nearly a decade ago and now lives near the pond — chose the Emerald Necklace locale for its natural history as a kettle pond, formed by a melting glacier thousands of years ago, and for its personal significance.